When baby is finally quiet it should be a relief, not a worry. At LEVANA®, we know how tempting it is to check on a soundly sleeping infant over and over again - just in case. Stella™ and Oma+™ work together to provide total peace of mind. See everything with a pan tilt and zoom camera and, when you’re not looking, know that you will be alerted immediately if baby is not moving. Breathe easier knowing LEVANA Stella and Oma+ will be there to help you check in a little less and relax a little more. This movement monitor can also be set to detect weak and irregular abdominal movements. If abdominal movement is occurring less than 8 times per minute the movement indicator light will flash orange and a different warning tone will sound. This feature is enabled by default but can easily be disabled. When you find yourself multitasking you won’t need to stop and recharge this monitor for up to 36 hours. PEEP (Power-on/off Energy Efficient Picture) sets your monitor and your camera to “sleep” when there is no sound in the nursery, saving hours of valuable battery life. 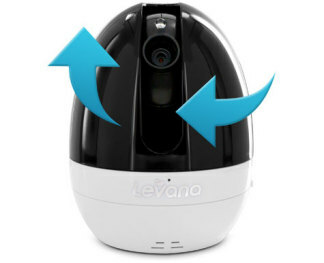 The second your baby makes a “peep”, the camera and the monitor will activate so you can see and hear exactly what is going on. Remember when your mother told you she had “eyes in the back of her head”? Now you can amplify your own parental superpowers with a pan/tilt/zoom camera. Use the monitor from anywhere in your home and adjust the camera view 270° horizontally and tilt vertically 110° to see everything in your baby’s room with the simple touch of a button. 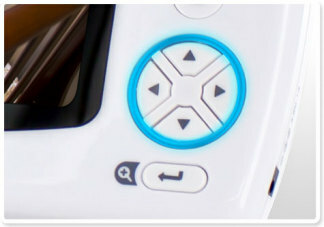 Let baby know you’re on your way with two-way Talk to Baby™ intercom. 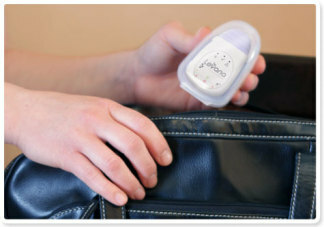 Calm your baby with the sound of your own voice as you head to the rescue. Levana parents also love this feature for communicating to each other when they need some help in the nursery. Invisible infrared LEDs provide a clear image of your child in the dark up to 12ft away. 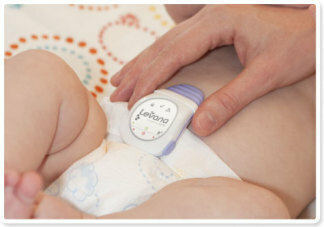 Your baby will sleep more soundly without the distracting red LED lights found on traditional baby video monitors. Rest assured knowing you can see your baby clearly, any time of day or night. ClearVu® technology provides you the outstanding precision and clarity of a digital signal from up to 750ft away. Stella has a private, secure and interference-free digital signal that no one but you can access. Feel free to accomplish tasks inside and outside of your home, all the while knowing baby is safe and sound. Does your baby love the sound of lullabies before bed and cry out for more when the music stops? Stella has three lullabies that can be remotely activated and changed by your parent unit. Stella’s expandable system grows with your family; add up to three additional cameras to conveniently view up to four areas of your home on one monitor. Battery life of 72 hours based on 10 audio activations while in power save (PEEP) mode. Battery lasts an average of 6 hours with continuous audio/video usage. Optimum range is 150 feet when signal is passing through walls or floors. Microwave ovens (when in use) may cause signal disruption at close range. Buildings with metal frames may also cause signal disruption. Maximum transmission range is 500ft. LEVANA® does not endorse any LEVANA® products for illegal activities. Levana is not responsible or liable in any way for any damage, vandalism, theft or any other action that may occur while a LEVANA® product is in use by the purchaser.